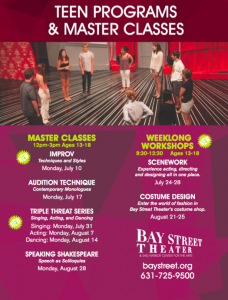 Bay Street Theater- Musical Theater Dance Workshop! One Day Teen Theatre Dance Master Class! On Monday, August 14th, from 12-3PM, I’ll be teaching a theatre dance workshop at Bay Street Theater. We’ll cover multiple styles of dance, audition techniques, and more. For ages 13-18. “Paris Girls” at New York Theatre Barn’s Choreography Lab! Avital joins the faculty of Mark Morris Dance Group!